What an amazing grilled Edamame and Beef on Toast! Teppanya Yoshi is in Fukushima area which there are many wonderful restaurants. At first, you must try to order "Yaki-Edameme". It is definitely No.1 Edamame. And "Marucho-yaki" and "Grilled Beef on the toast" are also must try. Amazing grilled Edamame with garlic oil! Ordinary Edamame are steamed young soybeans typically served with sea salt. 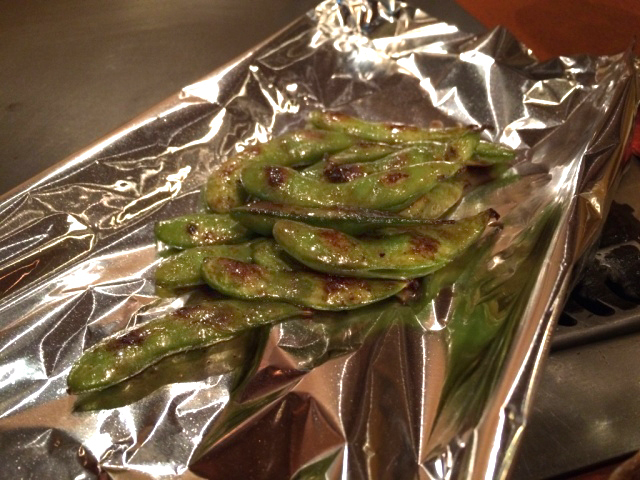 But Teppanya Yoshi's "Yaki-Edamame" is grilled with garlic oil. It is definitely No.1 Edamame I have ever had. I highly suggest the first order of food is "Yaki-Edamame". It goes well with alcohol! 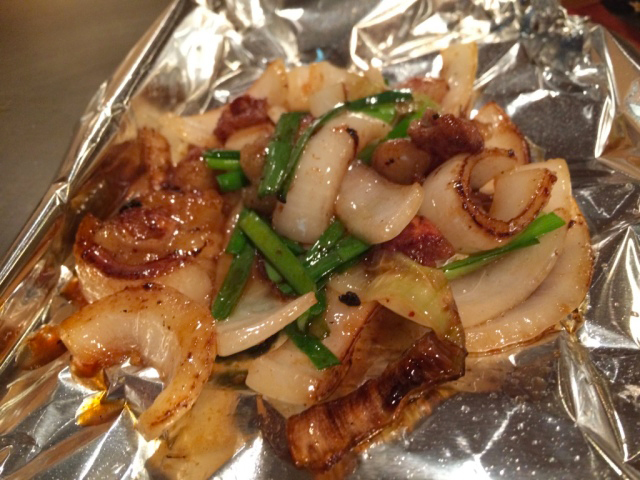 "Marucho-TareYaki" is grilled Small intestine. Almost restaurant's intestine are need chew hardly, but "Teppanya Yoshi"'s one is no need chew. Taste is so fluffy and excellent seasoning. It goes well with alcohol! 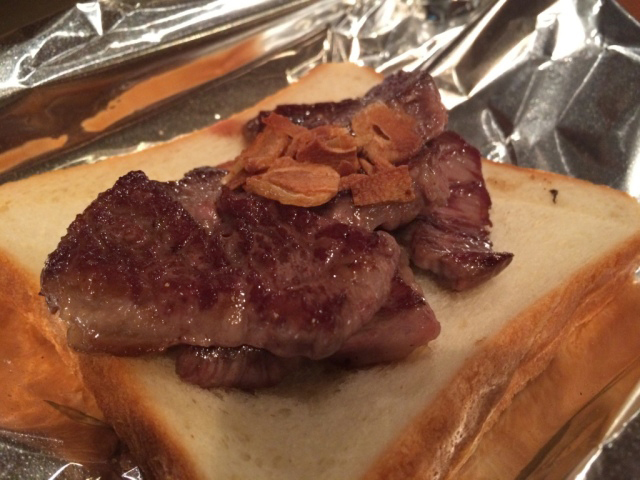 Delicious Beef and Surprising Garlic Toast! Grilled beef is also perfect! But Have you ever seen Grilled Beef on the Toast??? The Chef taught us "Because beef doesn't overdone on the toast. After finished to eat beef, chef pressed toast on the iron plate. And then he served Special Garlic Toast. It's meat juice and garlic oil mixed each other and the taste soak into the toast. 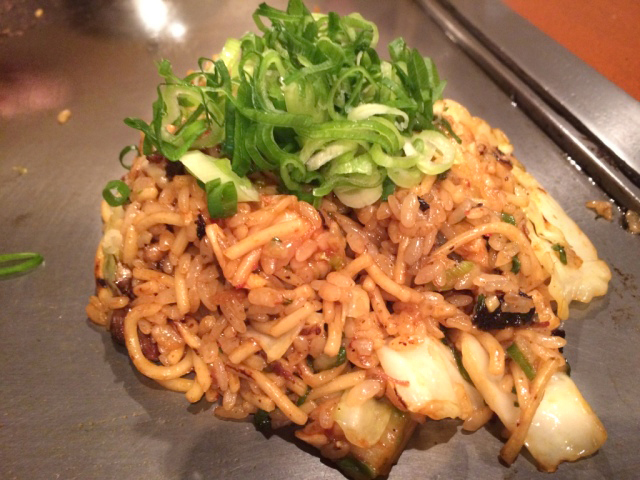 Sobameshi is pan-fried noodles and boiled rice. "Teppanya Yoshi"'s Sobameshi is mixed with Kimchi. The taste is a little bit of spicy but so good! It is very luxury fried rice. I want to eat it again soon. "Teppanya Yoshi" has a very nice atmosphere. Teppan-Yaki is definitely Cooking Entertainment. We can see cooking by chew from of us at "Yoshi". I highly recommended "Teppanya Yoshi" to yours.